I don't believe that Obama suffered because of the lack of campaigning allowed in Florida. And, if he did, so did Hillary. They had television. 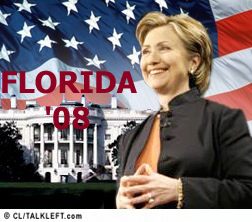 Floridians could watch the debates and the nightly news and read the newspapers. They weren't living in a cave. It's evident from the high turnout in the Florida primary -- 1.7 million Democrats voted in a primary that was not open to Independents-- that Floridian Democrats came out in record numbers. They voted early, voted absentee and voted on their primary day. In all, 4 million voters voted on Jan. 29, 41% of all registered voters. That's a huge percentage for a primary.